Although economically important, palms are a much neglected plant group in terms of understanding development and propagation potential thereof. Furthermore, progress in the field of breeding, genetics, crop improvement, and expansion of commercial plantings for palm has been restricted by the habit and long-lived nature of these monocotyledonous trees. Most palms can only be propagated by seeds, i.e., Coconut and Oil palm. 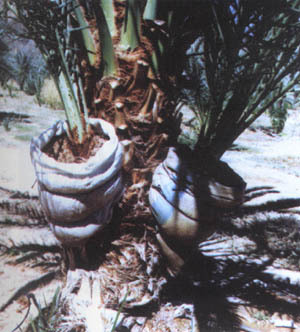 There are three techniques to propagate date palm: Seed propagation, offshoot propagation (traditional methods), and the recently developed tissue culture techniques. This chapter will highlight each of these techniques. * The above reasons result in waste of time, space and money. Thus, seed propagation is by far the easiest and quickest method of propagation. However, it is not a true to type propagation technique and no two seedlings will be alike. Because of its diversity, the seed approach could only be useful for breeding purposes. 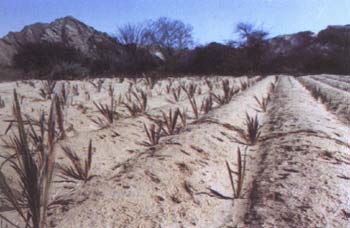 When conditions are known to be unfavourable for date fruit production (case of marginal areas), the planting of date seeds, for future selection on fruit quality, is the most economical way of selecting clones that have some desirable characters such as rain and/or salt tolerance (Figure 34). Taking the above into consideration, and also because of the many reasons listed below, date growers are encouraged to use tissue culture-derived material of known varieties with high date quality and marketing potential. (i) Offshoot plants are true to type to the parent palm. The offshoots develop from axillary buds on the trunk of the mother plant and consequently the fruit produced will be of the same quality as the mother palm and ensures uniformity of produce. (ii) The offshoot plant will bear fruits 2 - 3 years earlier than seedlings. The life span of the date palm is divided into two distinct developmental phases: vegetative, in which buds forming in the leaf axils develop into offshoots; and generative, in which buds form inflorescences and offshoots cease. From the time that the axillary bud of a leaf has differentiated into an offshoot until the time it grows outwards, takes up to three years (18 to 36 months), with another three to four years before it reaches the desired size for its separation and planting (Hilgeman, 1954). Offshoots are mainly produced in a limited number (20 to 30 at most) during the early life of the palm (10 to 15 years from the date of its planting) depending on the variety and on prior fertilisation treatment, irrigation and earthing up around the trunks, (Nixon and Carpenter, 1978). Although 20 to 30 offshoots are produced by a palm, only three or four offshoots are suitable for planting out in one year and must still go into the nursery for 1 to 2 years before field planting. Zahidi, Berim and Hayani varieties are known to produce large numbers of offshoots, while Mektoum and Barhee varieties produce relatively low numbers of offshoots. Offshoots are recognised by their curved form while seedlings have a straight form. Another way to differentiate between the two is that seedlings have roots all around their base with no connecting point to the palm, while an offshoot does not have any roots on the side where it was connected to the mother plant. Furthermore, an offshoot always has a mark on one side which is a result of detachment from its parent palm. The offshoot selected for removal must be disease and pest free and at least three to five years old with a base diameter between 20 and 35 cm (Table 32), weighing over 10 kg but not more than 25 kg because of handling difficulties. Signs of mature offshoots are the availability of theirown roots, first fructification and the production of a second generation of offshoots (Nixon and Carpenter, 1978). Small offshoots weighing 5 kg and less, if needed, could also be used, but their survival potential will be much lower than that of larger offshoots. They should initially be looked after, for at least two years, in a nursery, or mist bed in a greenhouse or a shade net structure (Reuveni et al., 1972). Fungi are usually a serious problem in a mist bed, and the offshoots must be treated twice a month with a large spectrum fungicide. The best time for the removal of offshoots and transplanting into the nursery for rooting (never directly into the field) is after the soil begins to warm up in the late spring and early summer (September/October in Southern hemisphere and March/April in the Northern hemisphere). February/March and September/October are then the most suitable period for field planting, respectively. Two types of offshoots occur on a date palm tree: the lower and older ones, and the upper and younger ones. It is believed that low offshoots are more active physiologically than high ones; they probably grow faster (the number of leaves produced increases with age). In fact, the high offshoots have less carbohydrates than low offshoots, resulting in low roots production and consequently low survival rate. It is also suspected that high offshoots develop when no fruit is on the palm. (3) planting young offshoots is advantageous as they will in turn produce a greater number of offshoots than older ones. Numerous factors to consider when rooting offshoots include: the size of an offshoot (often expressed in weight), type (upper or lower), origin of the offshoot, the method of removal and preparation for planting, as well as treatment of an offshoot after planting (Nixon and Carpenter, 1978). To promote rooting, the base of the offshoot should be in contact with moist soil for at least twelve months before removal. Production of high offshoots is primarily of a varietal character but also in some cases related to a damp climate. For these high offshoots, boxes or plastic bags/Hessian material could be fastened around the base of the offshoot. Another technique is to leave them on the mother palm until they mature. They are then removed and rooted in a nursery (Figure 35a and 35b). When the aim is the production of offshoots, no green leaves should be removed from an offshoot until it is cut from the mother palm, since the growth of an offshoot is in proportion to its leaf area. When larger offshoots are selected for the following year's cutting, all their leaves must be retained until the offshoots are removed. When leaves interfere with cultivation, they may be tied together. When a date palm is crowded with offshoots, only 5 to 6 larger offshoots could be left, considering the tree's equilibrium, and the other smaller ones could either be totally removed if not needed in the future, or have their leaves cut back close to the bud to retard their growth. After 3 to 5 years of attachment to the parent palm, depending on the variety, offshoots will form their own roots and start producing a second generation of offshoots. Only at this stage are they ready to be removed (Nixon, 1966; Nixon and Carpenter, 1978). Care and skill, acquired only by experience, is important in order to cut and remove an offshoot properly from its mother palm. The operation, usually carried out by two skilled labourers, starts by irrigation several days before cutting. Soil is then dug away from the offshoot(s) using a sharp, straight-blade shovel (a ball of earth, 5 to 8 cm thick, must be left attached to the roots of the offshoot, with the connection exposed on each side). Roots should at no time be cut closer than necessary, since most of the cut roots die and new roots just emerging are susceptible to injuries (Nixon and Carpenter, 1978). A specially designed chisel is recommended to cut offshoots. It is a rectangular cutting blade made of tempered steel, which is welded to a solid iron handle. One side of the blade is fl at and the other bevelled so as to form a sharp cutting edge. The following chisel dimensions could be suggested: Blade: 11 cm wide, 22 cm long and 2,5 cm thick; Handle: 120 cm long and 3 cm thick (Figure 36). Lower leaves must be cut off and the remaining ones tied together in order to facilitate handling. Once the loose fibre and old leaf bases are cut away and the connection between the offshoot and the mother-palm is located, the first cut is made to the side of the base of the offshoot close to the main trunk. The fl at side of the chisel is put towards the weak point of the offshoot and the bevelled side towards the mother palm. Injury must be avoided at all times, the offshoot's tender heart should never be damaged and the cutting operation must be only from one side to obtain a smooth cut surface. After completion of the removal of the offshoot, the old leaf stubs and lower leaves are cut off close to the fi bre and the basal part left bare of leaves. Ten or twelve leaves around the bud are retained and tied close together 6 to 8 cm above the bud with heavy twine or wire. The terminal parts of these leaves extending beyond the tie (20 cm above the tip - centre of the offshoot) are also cut off (Figure 37). It is advised that the cut surfaces of both the offshoot and the mother palm be covered with a copper sulphate product in order to avoid infection by Diplodia and other parasites. Survival of cut-offshoots depends to a large extent on the variety. Medjool's offshoot is far more difficult to establish than Deglet Nour or Zahidi. 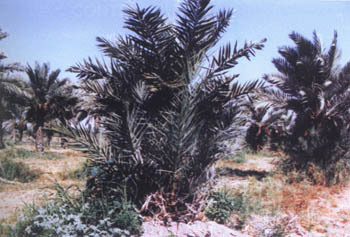 In places such as Fezzan (Libya), some areas of Iraq and Saudi Arabia, and Hadramaout (Yemen), offshoots are not at all removed and continue to grow outwards from the original mother palm, producing large clumps consisting of hundreds of shoots, none of which produces a trunk and of course with no significant yield (Dowson, 1982). It is advisable that an offshoot never be planted into the field directly after removal from the mother plant. A rooting period of one to two years in a nursery is essential in order to ensure an optimum survival rate and to avoid uneven development of the plantation. In most soils, the early and rapid growth of the offshoot is better when the holes are prepared one to two months before planting. The size of the hole should be one m³ and the holes should be filled with a mixture of topsoil and 10 to 15 kg of manure of high quality (with very little unmatured matter) and NPK fertilisers. The filled holes should be irrigated several times to promote the decomposition of the manure and also to allow the mixed soil to settle in the hole. Well-rotted manure can be used in holes prepared and irrigated shortly before planting, but extreme care must be taken to put the manure (and fertilisers) deep enough to form a layer of soil of at least 15 to 20 cm thick between the manure and the base of the offshoot. The leaf base of the offshoot should be clearly above the soil level. It is important to plant the offshoot to the depth of its greatest diameter in order to avoid the rotting of the base (if it is too low) and to prevent the water reaching the loose fibre near the bud which causes its desiccation (if it is too high). The plant water basin, of 1.5 to 1.8 m in diameter and 20 to 30 cm deep, should be prepared around the offshoot (Figure 41). The soil near the newly planted offshoots should be kept moist at all times by light and frequent irrigation. The irrigation frequency is dependent on the type of soil. Very sandy soils require daily irrigation during the first summer. Heavy soils require irrigation only once a week; while in most soils irrigation is required every second or third day. During the first six weeks (or till the appearance of new growth) the date grower should always inspect his/her planted offshoots to make sure that the surface soil does not dry and shrink away from the offshoot. A mulch of hay or straw around the offshoot will enhance moisture contention, weed control and finally improve humus in the basin (Figure 38). Young offshoots and tissue culture-derived plants should be protected from harsh climatic conditions (sun and wind during the first summer and cold the following winter) and against some animals (rabbits, etc.). 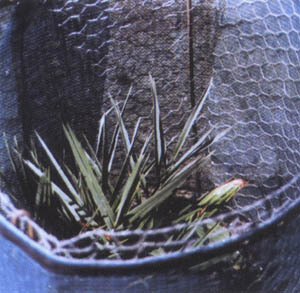 The use of shade net/hessian wrapping or a tent of date leaves is recommended (Figure 39). The top is to be left open so that new growth may push through. Under Namibian conditions (Southern hemisphere), there are two appropriate periods for planting: February/March and September/October. The first period is preferable since it allows a longer time for the offshoot to establish itself before the arrival of the next year's hot summer temperatures, although it passes through the cold months of winter (June, July and August) while the plant is still in its initial establishment phase. The second period (September/October) avoids the cold temperatures and later receives warm temperatures that allow an active growth followed by the hot summer (December, January). - Offshoot propagation is difficult, laborious, and therefore expensive. - The fruits produced will be of the same quality as the mother palm and ensure uniformity of produce (true to type). - The offshoot will bear fruit earlier than seedlings (by 2-3 years). Palms are a much neglected plant group in terms of understanding their development and vegetative propagation potential. Yet, they are economically important in tropical and subtropical regions. The rapid propagation of date palm as well as propagation from a mature specimen, is impossible due to the limited number of offshoots produced and the fact that offshoot production is limited to a certain period in the palm's life span. As mentioned above, seed propagation of date clones and cultivars is impractical. - Economically reliable when large production is required. The success of propagating monocotyledons in vitro has been limited to relatively few herbaceous species. Similarly, most dicotyledons, successfully tissue cultured, have also been the herbaceous types. It has been postulated that in woody plants, the ability to regenerate plantlets using tissue culture techniques was lower in comparison to herbaceous plants. In palms, until twenty years ago, little success was achieved in inducing and maintaining good callus. 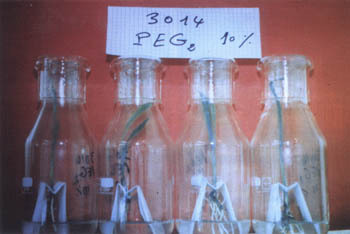 Plant tissue culture techniques have been employed to clone a wide range of plants and economically important palms e.g., coconut, oil and date palms (Cheikh et al., 1989). 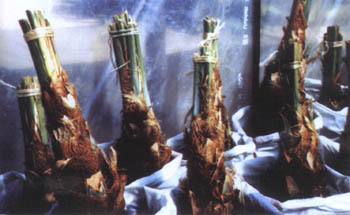 In reviewing date palm tissue culture, the classification followed will be that of behaviour and relevant techniques of tissue culture as a whole from a perspective of their eventual applications to date palm (Zaid and Djerbi, 1984; Zaid, 1985; 1986a; 1986b). This review also explains the background to the cloning methods applied to the date palm and explores the wide range of results obtained with embryo culture, meristematic tissues (shoot tips and buds) and highly differentiated somatic tissues (leaf, stem, inflorescence and root sections). Embryo culture involves excising an embryo-aseptically from the seed and planting it in a sterile nutrient medium (Hoded, 1977). Embryo culture is suggested to have several potential applications in plant research. It is used to save embryos that fail to develop naturally in the fruit or seed, or grow out embryos from interspecifi c hybridisation where defective endosperms are common (Johnston and Stern, 1957). Embryo culture may also be used to reduce lengthy dormancy periods due to physical and/or chemical inhibitors present in the fruit or seed (Hoded, 1977). Excised embryos cultured in vitro, free from these inhibitors, usually germinate immediately. Isolated embryos were also chosen as explant material in metabolic studies (Raghavan, 1976). The culture of isolated embryo segments may be useful to study the development of the primary meristems, organogenesis and the interactions between different organs (Rabéchault and Gas, 1974). The culture of embryo outside the seed was first performed with crucifers (Haning, 1904). It has since become a routine procedure. With regard to date and other palms, callus initiation and embryoid induction was first observed by Rabéchault (1962) working with oil palm embryos. Reuveni (1979) reported that callus and roots developed from the date palm embryo cotyledonary sheath tissue in media containing naphthalene acetic acid (NAA). This callus continued to proliferate and to differentiate roots when subcultured if a piece of the cotyledonary sheath was present. Ammar and Benbadis (1977) established organogenic callus from date palm cotyledonary sheath of zygotic embryo germinated in vitro. Reynolds and Murashige (1979) cultured embryo explants of Chamaedores costaricana Oerst, Howeia forsteriana Becc., and Phoenix dactylifera L. in vitro. Green date palm fruits, harvested two to three months after pollination were planted in a medium enriched with 2,4-dichlorophenoxy acetic acid (2,4-D), and a creamy-coloured grainy callus was subsequently developed. Transfer of this callus to an auxin-free medium resulted in the development of numerous asexual embryos. Mature zygotic embryos cultured in nutrient media containing charcoal with high auxins levels, 10 and 100 mg/1NAA, also produced nodular callus (Tisserat, 1979). Repeated culture resulted in the formation of plantlets. Tisserat and DeMason (1980), described plantlet formation from date palm tissue cultures. The morphological development of asexual embryos from callus closely paralleled excised zygotic embryo germination in vitro (Figure 40). Zaid and Tisserat (1984) performed a survey study to determine excised embryo callus production. In the Arecaceae, embryo excised from mature seeds of 38 species were cultured on modified Murashige and Skoog (MS) medium containing 3g/L-¹ activated charcoal; with 100 mg L-¹, 2,4-D and 3 mg L-¹ N6- (2 - isopentyl) adenine (2-iP). Embryo cultures from 18 of these species produced prolific callus after repeated reculturing for six months. 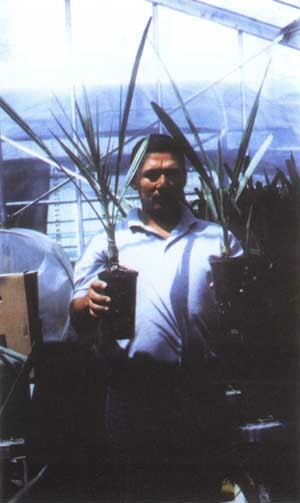 Zaid (1987) also cultured embryos of date palm to follow up their development. The sequence of germination is shown in Figure 41. 1. Shoot-tips and lateral buds are protected by bud scales and leaves, and are usually easier to surface-sterilise than root or stem explants (Morel, 1960). 2. By culturing shoot-tips or buds, an entire shoot is already present, thus only root induction is required to produce a whole plantlet (Morel, 1965; Williams, 1974). 3. The cells of the shoot-tips and buds are more uniformly diploid than those derived from less meristematic regions (Murashige, 1975). Presumably, plantlets derived from naturally meristematic regions are likely to be clonal and generate faster than other explant sources. A distinction is made between bud and apical meristem cultures. Lateral bud culture involves the growth of an entire rudimentary vegetative shoot. Apical meristem culture, ideally involves only the excision and growth of apical dome of the shoot usually less than 0.1 mm in diameter and 0.25 mm in length, sometimes with, though preferably without, a few leaf primordia attached (Cutter, 1965). In contrast to culturing herbaceous angiosperm shoot apices, few woody angiosperm shoot-tips have been established in vitro (De Fossard, 1976). Schroeder (1970) and Staritsky (1970) employing date and oil palms respectively, cultured shoot-tips in vitro with some success. However, most of excised shoot-tips either failed to grow or showed no root differentiation. Reuveni et al. 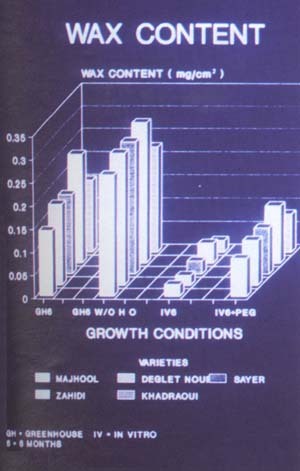 (1972) found that growing tip cultures of date palm responded irregularly to growth regulators, but optimal leaf development occurred when media contained 0.1 mg/1 NAA and 0.01 mg/1 kinetin. Callus occasionally formed at the cut surface of the tip, particularly in dim light, when low concentrations of auxin and/or cytokinin were present. Generally this callus was very short lived and its subculture was unsuccessful (Reuveni and Kipnis, 1974). El Hannawy and Wally (1978) observed some bud differentiation in date palm cultures. They reported that by adding 200 mg/1 "fermentol" to MS medium containing 1.0 mg/1 auxin and kinetin, and using an incubation temperature of 25°C, 60 % bud differentiation occurred. Scharma et al. (1980), using date palm shoot-tips, reported limited success in their development due to the browning of the tissue and media. Tisserat (1979), culturing date palm shoot-tips,found that a high auxin concentration of 10 and 100 mg/1 NAA and 2,4-D caused a reduction in the culture weight, and inhibition of shoot growth, but promoted the formation of yellow-white nodular callus. These nodules were precursors to asexual embryos. Transfer of callus to nutrient medium containing lower levels of auxins such a 0.1 mg/1 NAA or 2,4-D allows shoot development from tips to occur. Male and female shoot-tips were found to grow equally well. Root initiation was infrequent and did not appear to be related to the nutrient medium composition. Zaid and Tisserat (1983a) cultured date palm shoot tip explants from adult palms, offshoots, seedlings and asexual plantlets on modified MS nutrient media containing 10 mg/1 NAA. Differential morphogenetic responses were obtained dependent on the explant type and parent source (Table 33). The same authors also determined the action of several auxins and cytokinins on development of date seedling shoot-tips and apical meristems (Table 34). Shoot-tip explants consisted of the apical dome with two to four leaf primordia, and varied in size from 0.5 to 1 mm². Meristems and tips were cultured on modified MS medium containing 3 mg L-¹ activated charcoal, 0.1-300 mg L-¹ NAA, 2.4 - D, indoleacetic acid (IAA), indolebutyric acid (IBA), 4 - chorophenoxyacetic acid and 2iP. Best consistent shoot regeneration occurred on nutrient media containing 10 mg L-¹ NAA. These shoots were recultured on nutrient media, devoid of charcoal, containing 10 mg L-¹ NAA or kinetin to obtain rooting and enhanced shoot development. Best rooting was achieved with 0.1 mg L-¹ NAA with 63% of the shoots initiating adventitious roots after the first culture passage. Axillary bud outgrowths were occasionally obtained from shoots cultured on media containing 0.01 and 0.1 mg L-¹NAA only. (*) 15-20 cultures employed per treatment; results taken 8 weeks after planting. Most buds of date palm were reported to die within the first 30-50 days after planting in vitro (Reuveni and Kipnis, 1972; Schroeder, 1970). Only the largest and most distinctly differentiated buds grew. These buds exhibited leaf expansion and produced additional leaves. 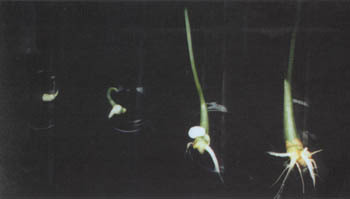 Tisserat (1979) and Zaid (1981) also investigated the conditions for bud development, and found that in nutrient medium shoot-tips and lateral buds grew equally well on the same medium. Callus cultures have been initiated from axillary buds of 2 to 4 year old date palm offshoots. Zaid and Tisserat (1983b) found that subcultured lateral buds callus on nutrient media devoid of charcoal and supplemented with 0.1 mg/1 NAA, produced adventitious plantlets. Tisserat and DeMason (1980) found that on a medium devoid of 2,4-D and 2-iP, sectioned buds callus consisted of two distinct types of tissues; a loose friable tissue and compact aggregates. The friable portion of the callus was composed of large non-meristematic cells and disorganised clumps which were highly vaculated and ranged in diameter from 20-40 µm. This tissue was not involved in embryo formation and was generally found surrounding the aggregate clumps which consisted of densely cytoplamic cells containing few vacuoles and usually were 8-20 µm in diameter. The formation of vascular bundles within the asexual plantlet at the 8- week old stage corresponded to that found in the zygotic seedling. Starting from the bottom of young leaves, soft tissues, shoot tips or axillary buds of date palm offshoots (Figure 42),and using MS half strength or Beauchesne medium supplemented by various auxins at a low concentration, buds were obtained after six months of in vitro culture (Beauchesne et al., 1986) (Figure 43). Early rooting of date palm tissues reduce bud multiplication and is, occasionally, responsible for the inhibition of bud initiation. In order to solve this problem, the bottom of young leaves of date palm offshoots were cultured on eight different nutrient media with different levels of growth regulators (Anjarne and Zaid, 1993). High level of auxins, especially NAA, allowed root initiation. These roots showed a rapid growth after subculturing on a medium containing a lower level of auxins. Furthermore, organogenesis was inhibited on media with a low concentration of auxins. Vitrification phenomenon of date palm tissues is a handicap for the successful in vitro multiplication of some date varieties and selected clones. In order to overcome such a problem, four culture media with different ammonium/total nitrogen ratio were tested, and bottom young leaves from offshoots of AGUELLID variety were used (Bougerfaoui and Zaid, 1993). It was found that ammonium plays an important role in the vitrification process. High levels of ammonium nitrate were found to enhance rapid growth and consequently tissue vitrification (46 to 53 % of cultures); while this phenomenon is reduced to 14 - 19 % in media with low levels of ammonium nitrate. Callus developed from a seedling date palm leaf (Schroeder, 1970), and gave rise to roots several months later. Similar results were obtained by Reuveni and Kipnis (1974). In their study, primordial leaves survived in culture and expanded, especially in the presence of light. The addition of plant growth regulators at concentrations of 0.1 mg/l and above was injurious to cultured leaves. Eeuwens and Blake (1977) working with date palm leaf found development of root initials to be enhanced by the presence of a low level of gas and auxins, and by a reduction in either the level of minerals or sucrose. Phoenix leaf petiol explant has initiated roots within 6 weeks when subcultured onto a medium with high levels of auxin (Eeuwens, 1978). Root initiation was not prevented by the presence of high cytokinin or low sucrose levels, but occurred more frequently in media containing high sucrose and reduced cytokinin levels. Poulain et al (1979) obtained some callus at the base of young date palm leaves. Buds developed at the insertion zone between young leaves and rachis. Roots were obtained on MS supplemented with a combination of low auxin levels such as 1.2 and 3 mg/l NAA, IBA, and IAA, respectively. Scharma et al (1980) noted callus from leaf petioles of date palm initiated in media employed by Staritsky (1970) or using Eeuwens Y/3 mineral formulation (Eeuwens, 1976). Zaid (1981), working with date palm leaf explants from adult trees, offshoots, seedlings and asexual plantlets, found that only subcultured leaf callus from seedling and asexual plantlets produced roots. Staritsky (1970) and Smith and Thomas (1973), both working with oil palms, and Eeuwens (1978) with coconut and date palms, obtained a white callus on a few stem cultures. Further attempts to subculture this callus failed. Phoenix stem explants reportedly enlarged considerably in size during the first few weeks of culture (Tisserat, 1979). Repeated culture to fresh media resulted in the formation of non-friable nodular callus. Plantlets were developed from this callus. Poulain et al. (1979) working with date palm stem tissues also successfully initiated callus. 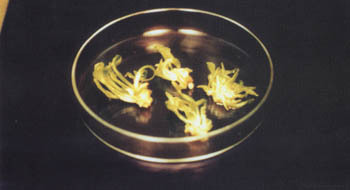 Inflorescences of several species have been cultured in vitro (Nitsh, 1963). Since 1973, several workers attempted to culture palm inflorescences. Explants of female and male oil palm inflorescences were cultured on a variety of media and usually developed somewhat normally, but callus was not obtained (Smith and Thomas, 1973). A high auxin level was speculated to be necessary to disrupt normal development. This has subsequently been confirmed in date palm (Eeuwens and Blake, 1977). 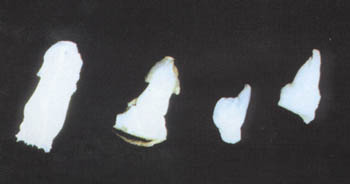 Date palm ovules, carpel tissue, parthenogenetic endosperm, and the fruit stalk blackened within 24 hours after culturing on nutrient media, and subsequently died (Reuveni and Kipnis, 1974). Also cultures of date palm floral bud reproductive tissues and especially male anthers, usually turned brown and died after a few weeks in culture (Tisserat et al., 1974). De Mason and Tisserat (1980) found that in vitro applications of auxins to media increase the frequency of visible expanded carpels developing from supposedly date palm male fl owers. Vestigial female date carpels on surviving male flowers enlarged and became quite prominent (Tisserat, 1979). White friable callus usually initiated from the floral bud strand (Tisseral et al., 1979). In some cases, roots and embryoids were initiated from explants of Cocos inflorescences rachillae (Eeuwens, 1978) and from date palm (Tisserat, 1979). Roots have not been initiated on inflorescence rachis explants which lack leaf or meristem tissue. 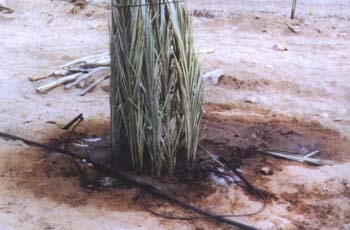 Date palm inflorescence culture was also largely investigated by Drira (1981). Morphogenetic responses were found dependent on the origin and physiological stage of the explant. Staristsky (1970) and Schroder (1970) were the first to investigate root cultures in palms in vitro. Oil palm root and root primordia failed to develop. Schroder (1970) observed that date palm root pieces in turn developed secondary rootlets but did not produce shoots. Eeuwens (1978) found that isolated roots excised from cultured explants of date and coconut palms continue growth and produce laterals when subcultured on liquid static media. Callus was also reported to form at the root tip region of young date palm seedlings (Smith, 1975; Smith and Thomas, 1973). This callus had produced leaves and shoots. 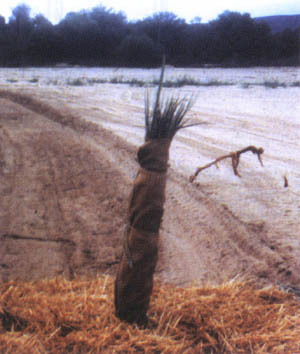 Other investigators (Scharma et al., 1980) reported no growth for cultured date palm roots. Usually, severe browning and death of root explants occurred within the first few weeks of culture. However, Zaid and Tisserat (1983a; 1983b), obtained some callus from seedlings and asexual plantlets roots when callus failed to exhibit any morphogenic response. During the course of in vitro growth and development, plant tissues not only deplete the nutrients that are furnished in the medium, but also release substances that can accumulate in the cultures. These substances, such as phenols, may have profound physiological effects on the cultured tissues. Date palm tissue cultures, like those of many other plants, have been commonly observed to release discolouring substances into the medium which inhibit their own growth. For date, injury through cutting of tissue is accompanied by secretion of the substance(s) into the medium. The intact organ, as exemplified by embryos or whole leaves on tips do not brown and thus grow well in culture (Reuveni and Kipnis, 1974). 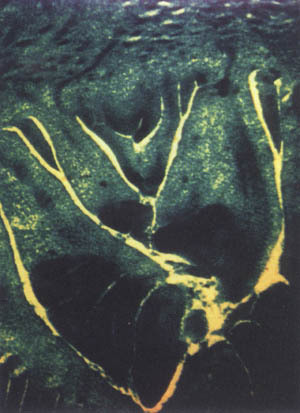 Browning of the tissue and the adjacent medium is assumed to be due to the oxidation of polyphenols and formation of guinones which are toxic to the tissues (Maier and Metzlier, 1965; Zaid, 1987). To minimise browning, Murashige (1974) has suggested the pre-soaking of explants in ascorbic and citric acid solutions and adding them to the culture medium. Zaid and Tisserat (1983a; 1983b) soaked their date palm explants in an anti-oxidant solution (150 mg/l citric acid and 100 mg/l ascorbic acid) prior to the surface sterilisation treatments. Addition of a combination of adsorbents including citrate, adenine and glutamine, retarded browning in date palm explants (Rhiss et al., 1979). Addition of other adsorbents to nutrient media, such as dihydroxynaphtalene, dimethylsulfoxide, were ineffective against browning in date palm explants (Zaid, 1984). Apavatjrut and Blake (1977) suggested that browning could be eliminated by a nutritionally balanced medium. Excision of browning explant parts during culture was also advocated to prevent this problem (Zaid, 1984). The use of charcoal is preferred over cysteine and other adsorbents because the latter are often toxic to the plant tissues at higher concentrations (Zaid, 1984, 1990). Addition of 3 % charcoal has caused substantial root and shoot growth of date embryos. Constantin et al. (1977) suggested that the growth regulators required for callus growth and shoot development for tobacco are adsorbed by charcoal addition. Similarly, Fridborg and Erikson (1975), postulated that the addition of charcoal to a culture medium drastically alters the properties of the medium. Hence, growth regulator substances are tested at high levels (e.g. 10 and 100 mg/l) with charcoal included in the nutrient media to obtain beneficial effects on tissues (Zaid, 1990; Zaid et al., 1989). Studies on the cryopreservation of date palm for germplasm collections were initiated by Towill et al., (1989). Shoot-tips were excised from 2 month-old seedlings derived from the cultivar "Medjool", precultured for 2 days and then cooled to liquid nitrogen (LN) temperatures using procedures described for potato and mint species. Viability of treated shoot-tips was assessed by growth in vitro. Dimethylsulfoxide (DMSO) in concentrations up to 10 % was not toxic, although growth was slower than untreated shoot-tips. Several combinations of DMSO and sucrose were effective in obtaining survival after LN exposure. 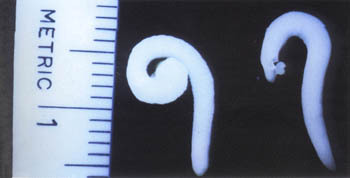 In most cases, the LN-treated shoot tips developed directly into a shoot without callus formation (Towill et al., 1989). Date palm plantlets may be produced through either; asexual embryogenesis, i.e. initiation and germination of somatic embryos from callus; or organogenesis, i.e. rooting and division of shoot tips and lateral buds. 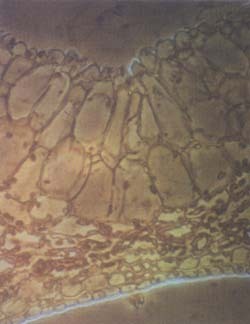 Organogenesis technique, based on meristematic tissues potentiality, avoids callus formation and does not use 2,4-D. Growth substances included in the media are used as low as possible. - Physiological stage of the offshoot, weight, age, signifi cation degree, period of introduction. - Varietal response to the technique/Lack of reactions of some clones and varieties. - Yield of the technique/offshoot. - Lack of results repetition. - Low and irregular multiplication rate. - Decrease of regeneration capacity (precocious rooting). - Loss of totipotency for some varieties. - Low effi cient rooting. - Low rate of survival. Asexual (also called somatic) embryogenesis, is based on the callus production and multiplication, followed by the germination and elongation of somatic embryos. 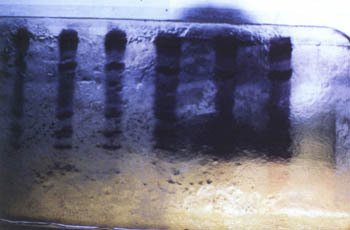 Up to now, this technique had shown to be genotype independent with a high rate of multiplication and a high survival rate upon transfer to soil. There is always a dispute amongst date growers, technicians and scientists about the true-to-typeness of plants produced in vitro. It is worth mentioning that tissue culture-derived plants of many species are subject to somaclonal variation in particular, and to genetic variations in general. Unlike epigenetic variations, which are at physiological level with non-heritable effect, genetic variations are affecting the genome and consequently are heritable (Pierik, 1987; Zaid, 1987; 1990). Most of the commercial laboratories are doing their best to ensure the true to typeness of the produced date plant material. Various techniques are used to produce and certify the conformity of the plants (Histo-cytology:Figure 44), iso-enzyme, RFLP (Figure 45), RAPD techniques). In most cases, fi nger printing is the technique actually used, but according to our experience we feel that the fi eld response is the only reliable way to confi rm if the palms derived from tissue culture are true to type to the plant mother. Up to now, only two cases of variation with Medjool and Barhee have come to our attention. Out of 2000 Barhee palms derived from asexual embryogenesis, only 2 are showing an abnormal vegetative growth (a ration of 0.1 %). These palms are marked and their fruits will be compared to the mother variety (Figures 46, 47 and 48). 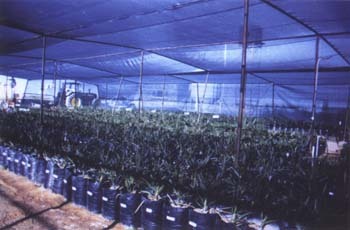 Various laboratories in the world have made attempts to propagate date palm by tissue culture techniques. According to the knowledge of the authors, success has been achieved at only a few international laboratories (Table 35). Some of these laboratories are recent (2 to 3 years), while others have been functioning for approximately 15 years. There are 9 functional laboratories known to the authors. These are found in England (1), France (2), Israel (1), Morocco (1), Namibia (1), UAE (1), Oman (1), and India (1). Information about the last two laboratories is not available. The commercial laboratory of the "Domaine Agricole El Bassatine" (Morocco), which since its start had produced ± 500,000 plants, is reserving all its production for national use. No signifi cant sale outside Morocco has been implemented because all the production is destined to rehabilitate the Moroccan Date plantations destroyed by the Bayoud disease. 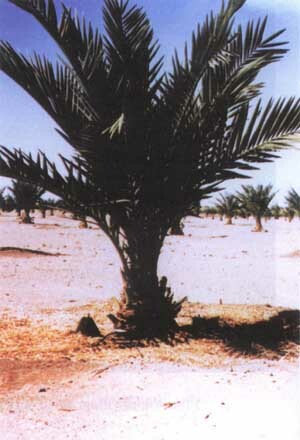 The remaining laboratories (England, France, Israel and Namibia) are potential sources of date plant material. Most of these laboratories' efforts were focused on the Medjool (and Barhee recently) variety with an average sale price (FOB) of about 20 to 23 US$ per plant. Delivered plants have only juvenile leaves and still need to be hardened-off by the buyer before fi eld planting (Figure 49). Note that the selling price depends on the variety, the number of plants ordered and the growth stage at delivery. (*) There is no order of importance in the list, which should also not be considered as exhaustive. Countries were classifi ed in an alphabetical order. Although in vitro mass plant propagation has become commercially feasible, many problems hinder its application to economically important crops. One of the major obstacles concerning the practical application of plant tissue culture to mass propagation has been the diffi culty of successful transfer of plantlets from in vitro conditions to a soil medium. Losses from 50 to 90 % of in vitro propagated plantlets of many species have been encountered at the time of transfer to soil (Zaid and Hughes, 1989a; 1989b). This isunfortunate because the ultimate success of plant tissue culture as a commercial means of plant propagation depends on the ability to transfer plantlets out of culture, on a large scale, at low cost and with a high survival rate. It is appropriate at this level to differentiate between the acclimatisation of date palm vitro plants at the laboratory's glasshouse and their hardening-off at the farmer's nursery. Acclimatisation presents challenges at least equal to those posed by the initiation of cultures because it marks the end of artifi cial control and the beginning of autonomous plant growth. Approximately 20 years ago it was stated that research concerning the preparation of in vitro plantlets for transfer to soil had been neglected (Murashige, 1974). Since that time many scientists have become interested in the effects that the transfer process has on tissue cultured plantlets (Zaid and Hughes, 1995a; 1995b). The culture of date tissue in vitro with almost 100 % relative humidity within the culture vessel can lead to various abnormalities in the plant structure (Zaid and Hughes, 1989c). Plants of many species produced in vitro often show morphological, structural, physiological and biochemical differences from those produced conventionally. These include reduced epicuticular wax deposits (Figure 50), altered leaf anatomy (Figure 51), excessive water loss and stomatal abnormalities compared to greenhouse grown plants (Zaid, 1995; Zaid and Hughes, 1995c). It is worth mentioning that loss of viability is attributed to poor control of water loss from the date plants and their heterotrophic nature. Stomatal development and frequency can be affected by water availability, light intensity, temperature, humidity and osmotic concentration of the culture medium (Zaid and Hughes, 1995b). Even when gradual hardening off has been used, poor survival and slow growth of date plantlets have commonly been reported. Such a low survival rate (that sometimes reaches below 50 %) is caused by several factors which are mainly young physiological stage of plantlets to transfer, inadequate root system, unsatisfactory irrigation schedule, and lack of technical care at the in vitro laboratory stage. - Well acclimatised plant as a fi nal product (Figure 52). Plants are then rinsed in distilled water to remove adhering agar and residual sucrose. A spray with Benlate solution at 0.5 % (or any wide spectrum fungicide) is important since it protects the plant from fungal attack. - Create an artifi cial osmotic stress (at the nutrient medium level). The transplanting operation should be done as quickly as possible to avoid plant dehydration and avoid root damage as far as possible. The soil medium must always be sterile and usually consisting of 1 peat: 1 vermiculite (v/v) mixture. Sterile sand with a large grain size could also be added to improve drainage. Bark is to be avoided because it dries out rapidly and causes a water stress situation. To summarise, the substrate should be a well drained one, yet with good water retention capacity. The adequate pH to work with should be about 6.5. 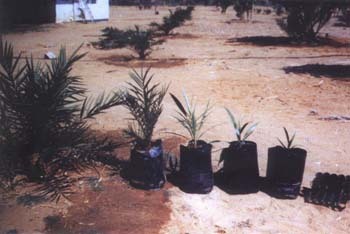 Plastic pots (7.5 - 12.5 cm), jiffy peat pots or trays (25 plants; in case of commercial production) are often used for date palm transplanting. Plants are immediately irrigated with 50 % Hoagland's solution or 10 % MS solution before their incubation into a micro tunnel located in an environmentally controlled glasshouse (or a large plastic tunnel). These environmental conditions will ensure a high relative humidity (90 - 95 %) and a constant temperature ± 25 - 26°C day time and 21 - 22°C during the night. Bottom heating of the micro tunnel (± 23°C) was found to be very helpful. To ensure a high survival rate, date palm tissue culture-derived plants should be adapted to gradually decreasing humidity and gradually increasing light. The light intensity is important during the first 3 to 4 weeks in the glasshouse (around 10,000 lux) with a 16 hr photo period. Benlate is to be applied to the foliage once a week, and irrigation using 10% MS solution (or 50 % Hoagland) every 3rd or 4th day depending on the hygrometry level of the micro tunnel. Four to six weeks later, the plastic of the micro tunnel is gradually opened in order to decrease humidity and prepare the plants to adapt to the large glasshouse (or tunnel) conditions which preferably should have a fog system. Plantlets are now ready to be transplanted to larger plastic bags. It is worth mentioning that at all stages, water should never be sprayed form the top of the plant. Plants could stay in the glass house (or a tunnel) for a period between 3 to 4 months before their transfer to a less environmentally controlled nursery, which is usually at the farmer's level, for their further hardening-off process. Plantlets received from a laboratory are usually about 35 to 45 cm long with 4 to 5 leaves among which are 0 to 2 pinnae leaves (called also permanent leaves). The plant must have a thick shoot system and the base must be similar instate to that of a large onion bulb (pear-shaped). As stated above, the plant must have a well developed root system. Transportation of these plants must be realised in a proper manner and plants must preferably not be stacked on top of each other to avoid stem breakage and/or leaf damage. Transport must preferably also be in one stage and if plants/truck are to stay over somewhere, it must be in a shaded area; watering should not be neglected if transport takes up several days. It is recommended that, upon reception of this material by the date grower, plants are transferred to larger bags (7 to 10 litres capacity) with an adequate substrate,usually sand (soil), vermiculite and gravel at a ratio of 1:1:1, respectively. Transplanting should be done properly with no disturbance to the root system. Original substrate around the roots should stay intact. Plants are then left in the nursery for approximately 8 to 12 months depending on surrounding conditions and care given, till most of them reach the 4 pinnae leaf stage. The date grower is advised to co-ordinate the purchasing and the hardening-off period, to ensure that planting can betimely implemented (during February/March for Southern hemisphere and September/October for Northern Hemisphere). The nursery size and type are related to the number of plants to be hardened-off. An average size of 150 m² will be adequate for 1,000 plants. An ultra-violet resistant shade net of 80 % is recommended during the first 6 months (Figure 53). During the summer time, the top of the nursery should have a double layer of the shade net for insulation purposes. The nursery should be well located (close to several trees to benefi t from their shade) but also in a protected area to avoid sand storms and severe wind. A water tap should be installed inside the unit for easy irrigation and the unit must be enclosed to avoid animals getting in and eating the plants. Irrigation is an important factor and must be implemented once a week in winter time and at least twice a week during summer. Water should never be sprayed on top of the plant; soil is to be mounted around the base of the plant so water can not get into its heart. Fertilisation is to be applied once per month: apply 5 g of ammonium sulphate/plant bag (5 % nutrient solution; thus 15 kg deluded per 63 litres water for 650 plants). Apply 120 ml of solution per plant bag. Control of diseases and pests is also recommended and the use of Benlate (or any other large spectrum fungicide) has proven to be highly efficient. Foliar spray of Benlate is to be applied every 3 to 4 weeks. Close monitoring is advised as mistakes could be disastrous; It is from our own experience, that we recommend a close follow-up by the date grower. If all above recommendations and advicse are respected, the date grower could expect a survival rate between 90 and 95 % (Figure 54). In Namibia, a total of 10,007 plants of various date palm varieties were hardened during 1996 and 1997 in both Naute and Eersbegin project sites (Table No. 36). The results obtained are satisfactory and after 8 to 12 months (depending on the variety and the source), a final survival rate of 92% was obtained (9,177 plants survived and successfully passed the hardening-off operation out of 10,007 plants). - Immediately after transplanting, an average percentage a loss of 3.2% occurred. - After 8 to 12 months in the nursery, the final survival rate was about 92% (9,177 out of 10,007 plants). A - Normal axillary offshoots after their separation from the mother palm. B - High offshoots on the palm using plastic bags fi lled with saw-dust. Figure 38. 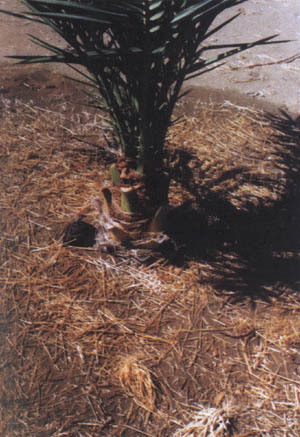 Basin around a young date palm (1.5 to 1.8 m diameter and 20 to 30 cm deep) with wheat straw as a mulching. C - Protection tent made of date leaves. Figure 41. Sequence of germination for Phoenix dactylifera cultivar Sayer excised embryos cultured on a modifi ed Murashige and Skoog medium containing 0.3 activated charcoal. From left to right: early cotyledon elongation stage (1 week old); emergence of first foliar leaf (3 week old); and established seedling in vitro (6 week old). Figure 48. 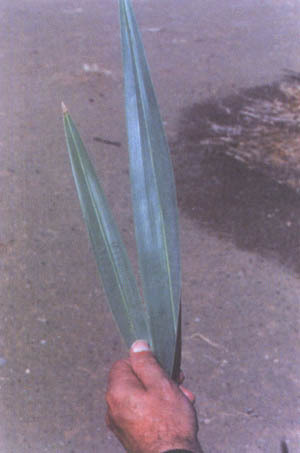 Large leaf size as an abnormality (Right: Variant Barhee; left: normal Bar-hee leaf); (Ref B14-Block 2, Naute Project, Namibia). Figure 51. Leaf anatomy of a Med-jool date palm. Note the size of the bulliform cells. Figure 52. Well acclimatized plants ready to go through the hardening-off process. Figure 53. An ultra violet resistant shade net of 80% is commonly used for date palm nursery (hardening-off at the date grower's level). Figure 54. Various stages of growth and development of date palm tissue culture plants during the hardening-off process. From right to left: 3 months, 6, 9 and 12 months old.